Dark Times Befall 'Painter Of Light' Thomas Kinkade Kinkade's familiar, cozy artwork adorns countless calendars and coffee mugs -- but his company is facing serious financial and legal trouble. The artist, who says the light streaming through his paintings is the light of Jesus, has been accused of fraud and was arrested for a DUI in June. 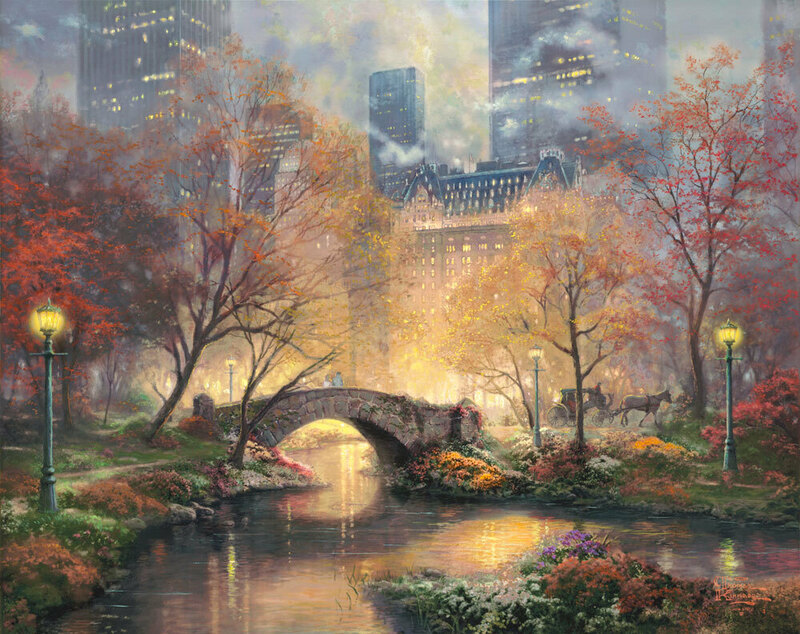 Central Park In The Fall is a 2010 work by "Painter of Light" artist Thomas Kinkade. The park, Kinkade writes, "is a place where a quick cab ride lets you escape the big city and immerse yourself in nature's brilliant color palette." 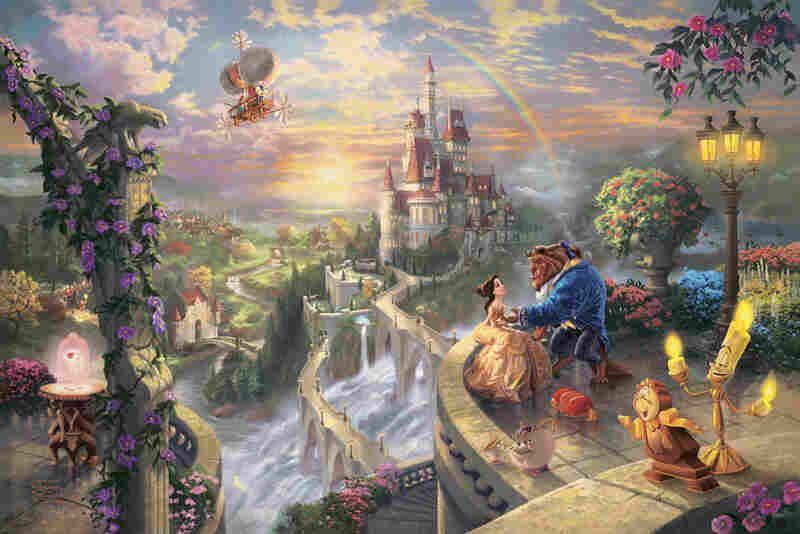 There's a good chance you own something by Thomas Kinkade. The artist's warm, cozy paintings have been widely reprinted on calendars, coffee mugs and more -- and it's estimated that his work appears in 1 in every 20 U.S. homes. Yet Kinkade's company is struggling. Dogged by fraud allegations, his company filed for Chapter 11 bankruptcy in June, and it plans to be back in court soon to file a plan of reorganization. 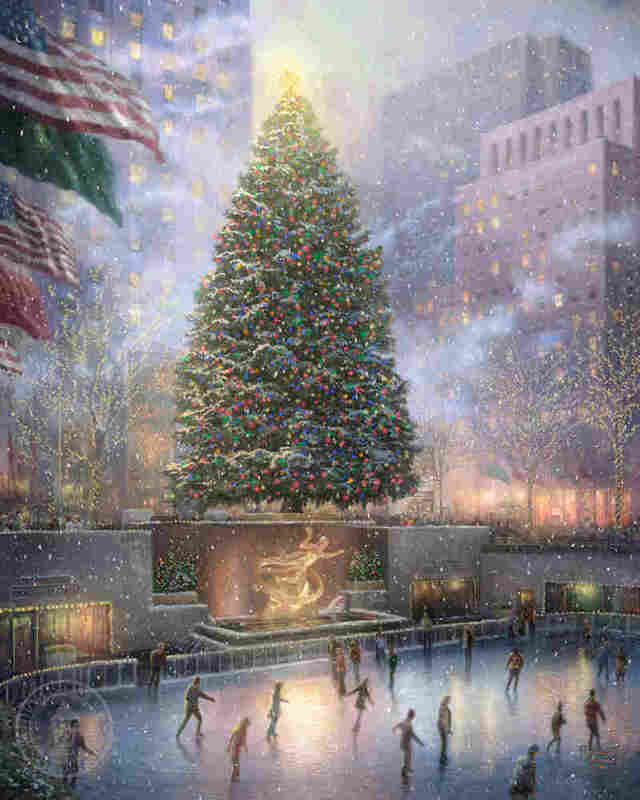 But financial challenges aside, Kinkade's artwork continues to sell. He is, after all, the "Painter of Light" -- he came up with the nickname himself. Kinkade has said that the light that streams through his paintings is the light of Jesus. Above, his 2008 work Christmas in New York. A Thomas Kinkade can make you feel like you're strolling down a cobblestone path to a cozy cottage with smoke puffing out the chimney. "When I look at a Thomas Kinkade painting, I get a warm, soft, cozy feeling," says window shopper Anna Kayne. "Like I want to go into where that is and be part of it." Kayne, who was browsing an art gallery in Irvine, Calif., says she particularly likes Kinkade's winter vistas -- the perfect blankets of snow over peaceful gardens, the snow-covered cottages lit from within. "I think it harkens back to some imagined past," she says, "before cities, before crowds, before traffic, before the stresses of everyday life." Ami Davis, who teaches art at the University of California, Los Angeles, wrote her master's thesis on Kinkade. "I've heard [about] almost quasi-religious experiences with some of these paintings," Davis says. Kinkade has said the light that streams through his paintings is the light of Jesus. But some of his gallery owners have accused the artist of using shared Christian values to defraud them. They say he persuaded them to open galleries in areas that couldn't support them -- and then competitively undervalued his own paintings. "It's very disappointing when an individual expresses a worldview that's about peace, love, joy, family, and then ends up taking a position that is contradictory," says Terry Sheppard, a longtime colleague of Kinkade's. Sheppard testified in lawsuits that several of Kinkade's gallery owners brought against the artist. The gallery owners won a nearly $3 million judgment and are attempting to collect after the company declared bankruptcy. To add to the artist's troubles, Kinkade was arrested for a DUI in June; his mug shot has made its way around the Internet. 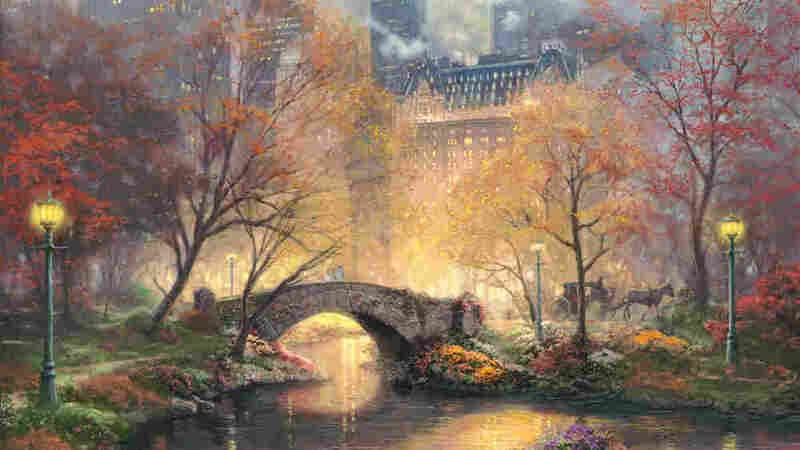 But never mind the legal and financial troubles, the criticism and the controversies -- Kinkade's work continues to sell. "I've been carrying Thomas Kinkade for over 22 years," says Marty Brown, co-owner of the Village Gallery in Irvine. "And the fact that he's been selling with such regularity for such a long time is unprecedented." 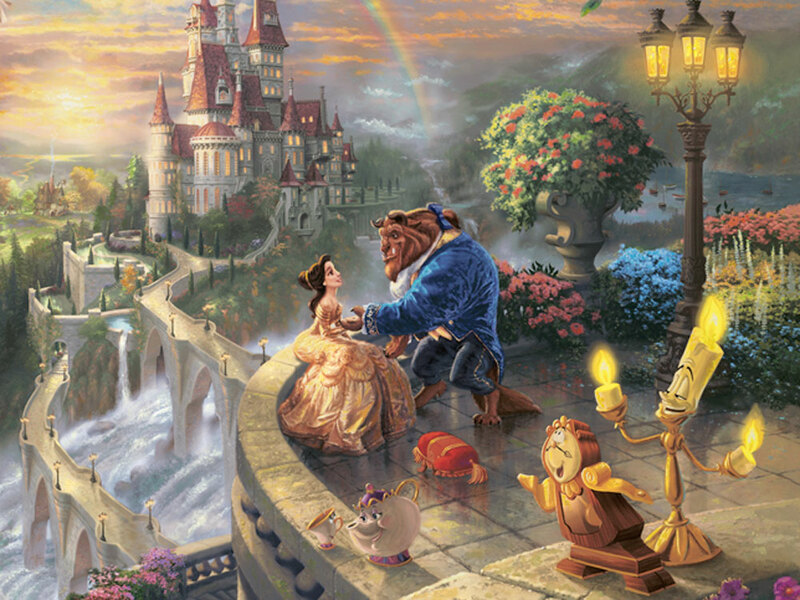 Beauty and the Beast Falling in Love is a 2010 painting from Kinkade's Disney Dreams Collection. He says in his paintings for Disney, he has "attempted to portray a panorama of the entire movie, rather than an individual scene." The Kinkade Co. sees the success as part of a calculated business mode -- it methodically sells Kinkade's products in as many formats as possible, from calendars to lithographs to armchairs. "What's compelling about this brand is, over the course of time, about 25 million people have purchased a Kinkade product," says company COO Frank Turrell. "That's an incredible footprint." Turrell adds that the company is also changing strategies, and the galleries at the heart of the fraud allegations are no longer the main key to expansion. New plans include building partnerships with companies like Disney and Warner Bros., and strengthening avenues that cater directly to consumers, like home shopping corporation QVC. "If you can restructure the fundamentals of the business and get the cost structure down," Turrell says, "there's an enormous demand out there for Tom's products." Not that any of these corporate strategies matter to Kinkade's longtime fans such as Kayne. "This is the first time I heard of his bankruptcy," she says from the gallery in Irvine. "And I don't look at his paintings any differently. I won't."